Perhaps a better title might have been “The influence of a Basque nationalist in the ideological education of Augusto César Sandino”, because, honestly, it seems like there’s very few of Sandino’s ideas in the modern Sandanista Movement. But let’s get to the point. The Nicaraguan daily El Nuevo Diario has recently published an op-ed piece by Jorge Eduardo Arellano called “Sandino y Sus Ideas” (Sandino and His Ideas). 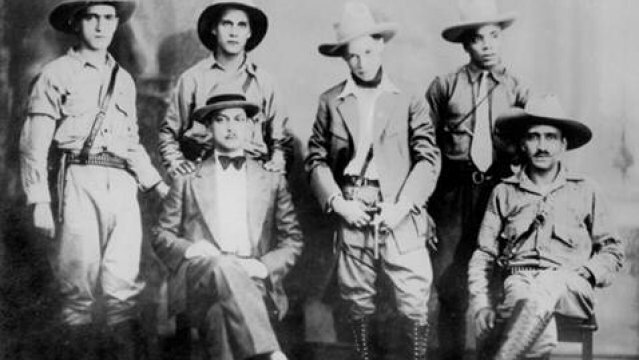 In this article, the author describes the different sources of throught that created the ideological corpus that guided the leader of the resistance against the US occupation of Nicaragua: national hero Augusto César Sandino. Among the influences the author highlights is Ramón de Belausteguigoitia, who’s defined by the article as the “Basque cooperative anarchist who wrote the book “Distribution of Land and National Problem (1933)” (though we believe he’s actually referring to the 1932 book, published by Espasa, “Distribution of Land and National Production”). We have to admit that even though we couldn’t place him at first, perhaps because of the “anarchist” he was described as, the name Ramón de Belausteguigoitia is not unknown to us. So, we turned to the Encyclopedia Auñamendi (an Internet resource about all things Basque that we cannot recommend highly enough) and there we were greatly surprised. The “anarchism” attributed to the Basque author, lawyer, and journalist, “magically” transformed into Basque nationalism, and the Basque Nationalist Party (BNP). This extraordinary man was born in Llodio, in Alava. He was a laywer who played for Athletic Bilbao, promoted agricultural projects in the New World; was an author, journalist, and also soldier for the Mexican Army against Naziism. He was a traveler an active member of the Society for Basque Studies, the Mexican Basque Center, and Francoist opposition and resistance. And, most of all, he was a PNB Basque nationalist. As such, he defended the recovery of full sovereignty that the Basque nation had enjoyed until 1839. He did so with a project for the Basque nation that included co-official status for Basque and Spanish, the development of a Basque university, an inter-classist society, a national Church, and administrative autonomy. So, the question is, how did his cooperativist ideas come to be defined as anarchist? It’s undoubtedly due to the fact that the idea of cooperativism so ingrained in the Basque nationalism of the day (and which was the seed of Basque cooperativism today) is revolutionary. It’s revolutionary because it opposes both the soullessness of capitalism and the dehumanizing nature of Marxism at the same time. Maybe that’s exactly why Sandino incorporated his ideas so easily, because that anti-capitalist, anti-marxist idea was what guided his political thought. It’s curious to see how today, that belief in the existence of a “Third Way”, so clearly present in the Basque nationalism of the ’20s and ’30s, and profoundly fed by the Church’s Social Doctrine, is still so revolutionary it still deserves the label “anarchist”. An abertzale, with a highly developed view of society, with an ideology that was similar to that which guided the Basques through the hard years of the Spanish Civil War, is the same Ramón de Belausteguigoitia the Nicaraguan newspaper article is talking about. If any reader is interested in getting to know this Basque’s ideas and thoughts, we recommend the work of Iker Gonzalez-Allende: El imperialismo espiritual de Ramón de Belausteguigoitia: América y España en el pensamiento de un nacionalista vasco (The Spiritual Imperialism of Ramón de Belausteguigoitia: the Americas and Spain in the Thoughts of a Basque Nationalist), published by the University of Nebraska. We’ll also leave you with a reference of a fragment of his book Con Sandino en Nicaragua. La hora de la Paz (With Sandino in Nicaragua: the Hour of Peace) (1934). 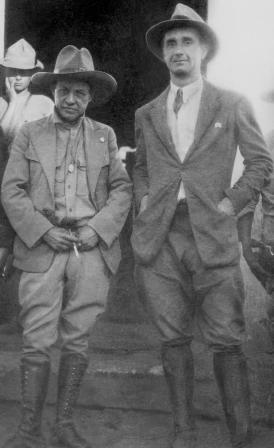 El pensamiento de Augusto C. Sandino, ecléctico e inorgánico, asimiló las corrientes de su época. En primer lugar, la red impulsada por los políticos e intelectuales latinoamericanos que integraron, entre otros, el peruano Víctor Raúl Haya de la Torre (1895-1979), nacido en el mismo año que el nicaragüense; el mexicano José Vasconcelos (1882-1959) y el argentino Manuel Ugarte (1874-1951). Haya de la Torre, con su Indoamérica y su indoamericanismo, resultó clave para la creación del indohispanismo —categoría muy utilizada por Sandino—, orientada a reconocer equilibradamente el mestizaje como factor de identidad (“la raza indohispana”).